Nice fabric had the colors I needed. Yes I would recommend to a friend. 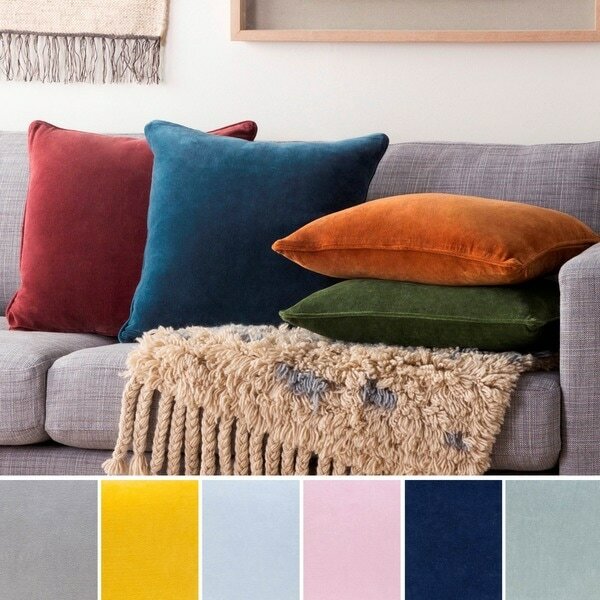 Brighten up your space with this soft accent pillow, available in 10 versatile colors. The plush cover is made from a cotton and velvet blend that gives the cushion a subtle sheen. Choose your favorite hue and then select between down or polyester fill to suit your needs. Great quality-comparable to much more expensive in Pottery Barn etc. the color is fully saturated, velvet is soft, quality stitching. Down insert good quality. The color (orange) was just as shown in the picture. The pillows are soft and seem of good quality. The fill is the perfect density. Very happy with purchase. I ordered two of these in blue to match another pair of pillows I have for my sofa. The color is just as depicted in the pictures, which is great! I also like the size of the pillows. I wish they were a little fluffier, though. The fabric of the case also shows stains easily. It's not a problem since the cover can be removed and washed, I was just surprised that a little baby drool stands out so starkly against the blue. I'd probably buy these again if I needed reasonably priced accent pillows, but I would go for something more pleasing to the touch and comfortable if I wanted a pillow you could snuggle up with and watch tv. Love these pillows! The velvet is luxurious and gives great texture to my dark leather sofa. The color is rich and simple. They work perfectly! These are perfect for our library couch. They are super soft and mold to more shapes than the standard filling, which is why I bought the down. They also matched perfectly to our other navy furniture in the room, which comes from different companies, so it seems they are using the same navy velvet fabric. My husband and our little dog are very happy too. These are awesome pillows. I love the Mint Blue, they look amazing and give me that touch of blue on my black leather couch I was looking for 👍👍👍👍👍. The quality is totally there and no wierd smells. I highly recommend! Pillows were exactly as expected, go with the down filled for a better look and fluffy feeling. the color was exactly what I was looking for. Great pillows! Must buy! They are well made and great price. Beautiful down pillows. Nice green earthy color. 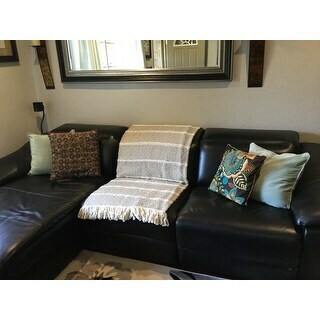 It looks like the color of the first picture with the pillows piled on the sofa. Received two of the blush pink pillows...Well made and substantial! Very satisfied! These pillows arrived very quickly and are a great addition to our living room. The color is not too bright. The fabric is not as soft as I was hoping but they still look pretty. I have a yellow and white striped couch! "Does this pillow have a zipper?"